The battleground is set for fireworks at the Resorts World Manila tomorrow night with MP Promotions and Ringstar Asia combining forces to stage an all-action 11-fight, 84-round card headlined by two IBF title eliminators. The first eliminator pits IBF No. 3 Kenny Demecillo and IBF No. 4 Michael Dasmarinas in a bantamweight 12-rounder. No fighters are ranked No. 1 and No. 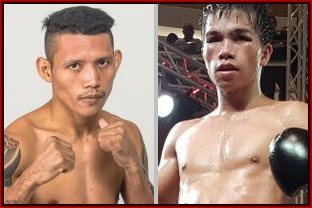 2 by the IBF so Demecillo and Dasmarinas are the highest-rated contenders in the 118-pound ladder. Whoever wins gets a crack at the IBF throne whose current tenant is Puerto Rico’s Emmanuel Rodriguez. There’s a possibility that the winner may be elevated to IBF champion outright because Rodriguez is facing “regular” WBA titlist Naoya Inoue of Japan in a World Boxing Super Series (WBSS) semifinal in Glasgow on May 18. The Rodriguez-Inoue survivor will advance to meet the winner of the other WBSS semifinal between “super” WBA beltholder Nonito Donaire, Jr. and WBO king Zolani Tete of South Africa at the Cajun Dome in Lafayette, Louisiana, on April 27. If Rodriguez loses to Inoue, it’s likely the highly-favored Japanese will relinquish the IBF crown and pursue unification with the Donaire-Tete winner. That would open the door for either Demecillo or Dasmarinas to claim the vacant title. Dasmarinas, 26, is recognized as the world bantamweight champion by the IBO, a governing body that isn’t as prestigious as the WBC or WBA or WBO or IBF. Because he’s listed as a world champion, Dasmarinas will be honored with IBF superflyweight titlist Jerwin Ancajas and WBO minimumweight ruler Vic Saludar as Boxers of the Year at the Elorde Awards Night on Monday. That’s added pressure on Dasmarinas to repulse Demecillo since he wouldn’t want to be cited coming off a loss. Dasmarinas’ record is 28-2-1, with 19 KOs compared to Demecillo’s 14-4-2, with 8 KOs. Both are certified sluggers who give as much as they take. Demecillo, however, is no pushover. In March last year, he knocked out Vyascheslav Mirzaev in the fifth round, a rarity for a Filipino to win over a Russian in Russia. Demecillo, 26, is the closest fight-alike among today’s Filipino boxers to former WBC superfeatherweight champion Rolando (Bad Boy from Dadiangas) Navarrete. He’s durable, iron-fisted and determined. A knockout ending is imminent. In the other title eliminator, IBF No. 4 Samuel Salva and IBF No. 5 Rene Mark Cuarto tangle for the right to challenge IBF minimumweight titleholder DeeJay Kriel of South Africa. The IBF doesn’t rate anyone either No. 1 or No. 2 in the 105-pound division and Mark Anthony Barriga, who lost in a title bid last year, is No. 3. Salva, 21, is unbeaten with a 16-0 record, including 10 KOs while Cuarto has a 16-1-1 record, with 9 KOs.